The gaze heuristic is the simplest one and works if the ball is already high up in the air: Fix your gaze on the ball, start running, and adjust your running speed so that the angle of gaze remains constant. 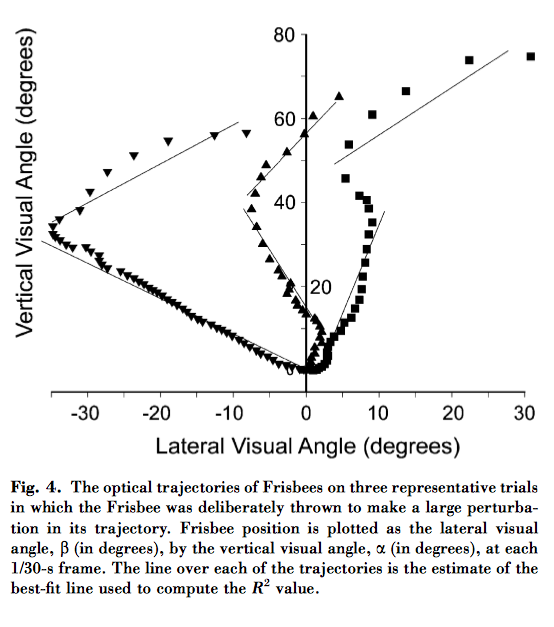 A player who relies on the gaze heuristic can ignore all causal variables necessary to compute the trajectory of the ball––the initial distance, velocity, angle, air resistance, speed and direction of wind, and spin, among others. By paying attention to only one variable, the player will end up where the ball comes down without computing the exact spot. We know that dogs follow similar dynamic heuristics when catching frisbees. In more technical terms, dogs follow a 'linear optical trajectory' gaze heuristic. While I thoroughly recommend reading the full paper on frisbee-catching dogs, we can examine the most basic gaze heuristic described by Gigerenzer to show the logic of behaving according to these heuristics in a dynamic world of uncertainty. In essence, I want to show that due to uncertainty human behaviour is dynamic and differs radically from the homo economicus behavioural assumptions almost universally applied in economic analysis. Further, such behaviour can be identified as the mechanism which connects price and investment dynamics in economic systems. 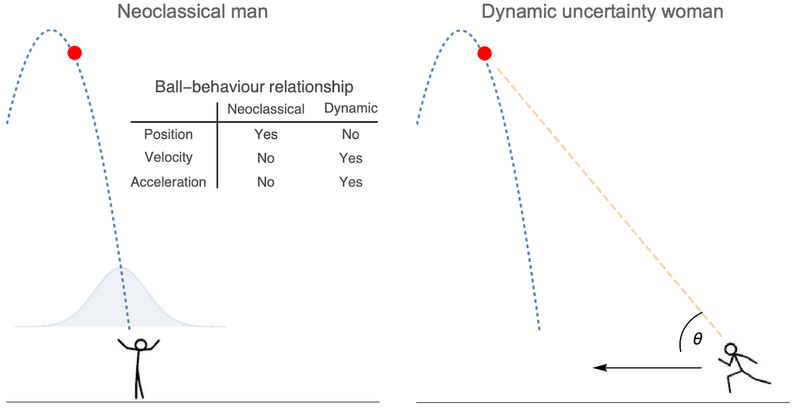 Below I summarise the basic difference in behaviour between neoclassical man, who makes a choice at a particular point in time based on expected probabilities, and dynamic uncertainty women, whose behaviour responds to the dynamics in her environment. Neoclassical man observes the ball, develops a probabilistic expectation of where it will land, and instantaneously positions himself at the most probable position. Dynamic uncertainty women observes the ball and begins running from her current position towards the ball, linking her run to the ball’s trajectory by fixing her angle of gaze. We can think about the ball as the environment our catchers respond to. Neoclassical man sees the ball’s position and generates expectations, ignoring its dynamics of velocity and acceleration, or merely developing some expectation about them. In economic models, such behaviour is reflected in static optimising on price levels based on expectations. But to dynamic uncertainty woman, the position of the ball has no effect on her behaviour. Her own velocity is tied to the ball’s velocity through the fixed gaze angle, no matter what her starting positions or progress in her run. Only as the ball accelerates does her action change, and she will accelerate her run as the ball accelerates towards the ground (including changing directions when the ball drifts). In economic terms, the ball is the business environment and each individual catcher is making their running investment decisions in response to that dynamic environment. Using a gaze heuristic this implies matching running speed (investment rate) with the balls speed (rate of change in real demand). 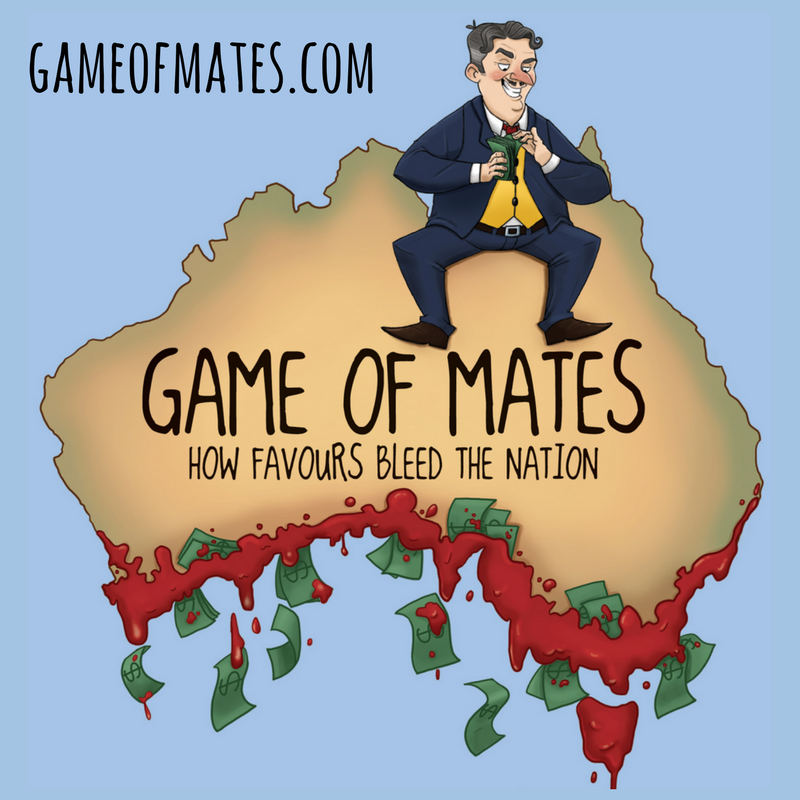 So what happens when the business environment changes? In our analogy, this implies an acceleration of the ball (a change in velocity). We know from experiments on dogs chasing frisbees thrown in order to swing severely that the reaction of a dynamically uncertain dog will be to change paths at the current relative position by adopting a new gaze angle linkage with the ball. Below we see dogs reacting to a swing in a frisbee throw by updating their gaze heuristic and following a new path in relation to the frisbee’s new velocity. Under dynamic uncertainty a change occurs via an acceleration in environmental conditions. In economic systems these environmental conditions could be asset prices, product demand, or some another indicator guiding investment decisions. Remembering of course that investment decisions by businesses in one part of the economy generate the economic conditions that other firms respond to, meaning that economic cycles are emergent phenomena of interacting uncertain agents, be they firms, governments, consumers, banks and other actors in the economy. Applying the gaze heuristic to investment decisions, where asset prices are the environment to which investment responds, results in an incentive to bring forward investment when the acceleration of asset prices is positive, and an incentive to delay investment when the acceleration of prices is negative. The 'micro-foundations' for this behaviour requires some explanation. 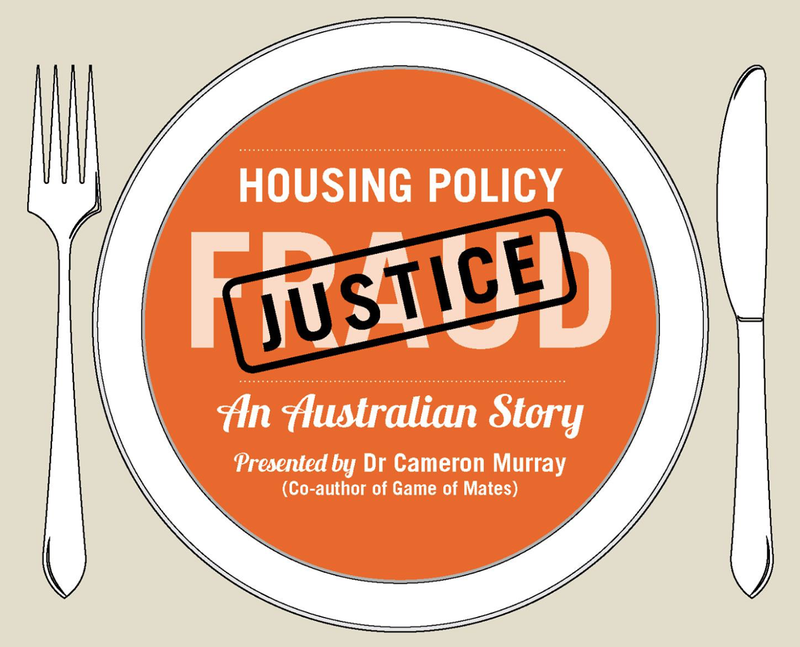 In essence asset owners, be it land, or some other scarce monopoly right, face the decision of when to exercise their option to invest in irreversible capital equipment that takes advantage of those rights – construct a building to package with property rights, build a transmission tower to package with spectrum rights, and so forth. Since the option has a value growth over time without needing to be exercised, the optimal time to exercise will be when its value is increasing at an increasing rate (accelerating). The cyclical link between asset prices and investment arises because when investment is brought forward it slows the acceleration of asset prices, providing a feedback in the system. 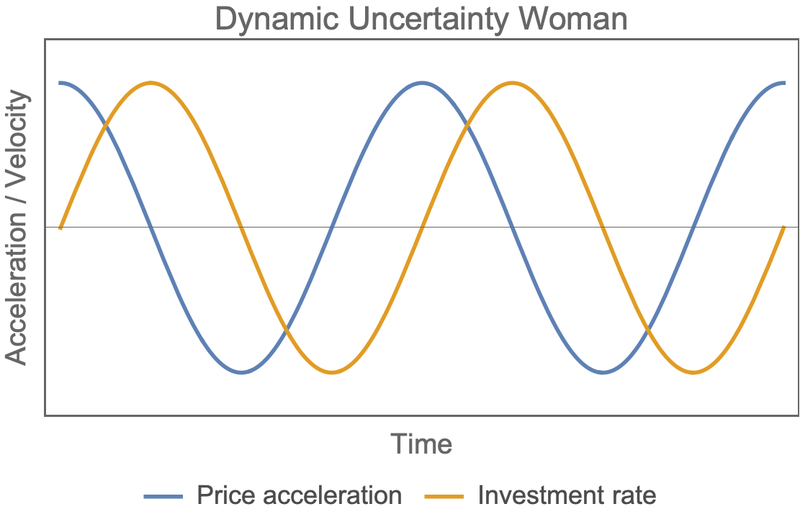 To be clear I show below a stylised cycle that results if people behaved like Dynamic Uncertainty Woman in an economic environment; monitoring the dynamics of asset prices and adjusting the rate at which they invest in new capital in response. We end up with an out-of-sync cycle of asset prices and investment activity. There is also a very tight link between this behaviour under uncertainty and the numerous empirical relationships observed by Steve Keen between the acceleration of debt, the growth rate of asset prices, and the employment level. Keen observes that the acceleration of the debt level approximates the rate of change in the price level of relevant asset classes, while my additional input is that investment growth responds to acceleration of prices. This analysis implies the following relationships: Debt acceleration creates price growth, which creates investment (and employment), but that investment also requires debt funding, leading to more growth, and a cyclical feedback. If price acceleration is a key factor determining investment growth, then perhaps even the third derivative off debt, the jerk, is leading to tangible behavioural results and implying the potential for high degrees of instability in the system. To me, it makes perfect sense to first look at human behaviour in dynamic settings before conjecturing about what is or is not optimal by introspection. The widely observed gaze heuristic in humans and other animals provides a clear case where dynamic behavioural rules lead to effective actions in other settings. But the same logic applies in social and economic environments as well. Too often the introspection approach to economic theory overlooks our easily observed biological instincts which evolved in a dynamic and uncertain world.
" Too often the introspection approach to economic theory overlooks our easily observed biological instincts which evolved in a dynamic and uncertain world." How to make yourself popular with "Austrian" economists. I find this very convincing,,, I am wondering why you chose 'woman' for dynamic and 'homo econ' (presumably man) for static neolib? Is there a reason/link or is it just the luck of the draw or just seeking an 'obvious' alternative -- as in male vs female? In other words, is female more dynamic/pragmatic while male more static/ideological? Just needed a break from the male-dominated mainstream econ world. I might have had Joan Robinson in mind when thinking about challenging the status quo! Thanks Cameron. Thinking a bit about it, I have the feeling that there is at least a whiff of a biological argument that probably could be made. Maleness tends to focus on focus and the binaries (particularly competitive binaries) while femaleness treasures complexity and diversity in a way that implicitly challenges the binary competitive world view. If you look at almost any serious 'feminist' scholarship in any mainstream discipline , including biology and economics as examples, and the feminists have brought complexity and nuance and subtlety to the table in a way that deeply challenges formerly held 'obvious' views or takes on the world from the historical patriarchy..